Still trying to dig out from the fluffy stuff around here – looks like another 2″ to 3″ on top of the previous ~7″ fall. White gold if you happen to live on a well. That snow will melt slowly into the ground and keep our water supply up for a while – hoping for more because it has been pretty dry around here as of late and worried if we do not get a soggy spring we are going to be in for some hauling. Funny how perspectives change with age. I remember leaping out of bed on a school day morning after a night of a good winter snow hoping for the talking head to announce the school closings. Now I gently roll my aching body out of bed and hope there’s enough snow to saturate the ground…and admittedly to see if I can go make snow angels (some experiences from childhood never get old!). I’ll save the angels for tomorrow, tonight it’s time to add another new bird to my list. Before I go any further, I must admit these shots are not bound for any walls. The mere fact you can make out that it is a bird is lucky, the ability to get it focused enough to validate the key features to ID it is a complete miracle. 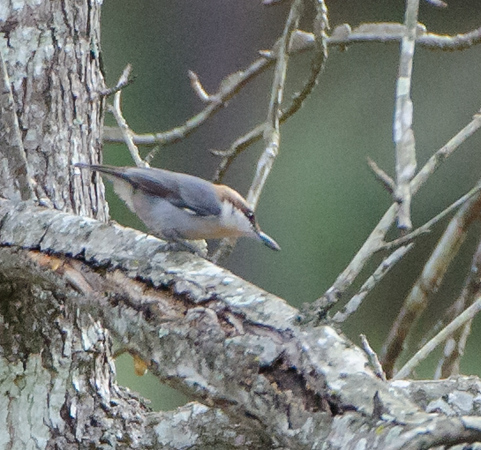 The creature you see before you (sometimes it helps to squint to artificially make the soft edges a bit sharper), is a Brown-Headed Nuthatch. 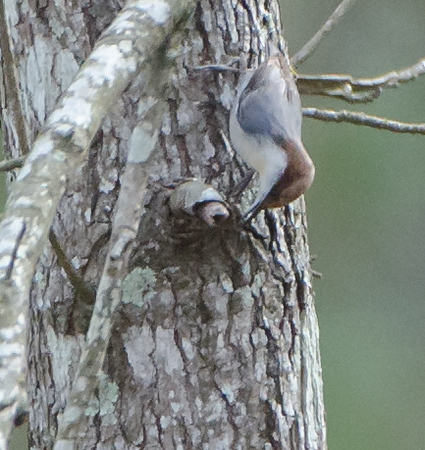 You really just needed a coupled of clues to get this specimen categorized – it has a brown head and it is pointed straight down a tree trunk – Alex I’ll take Easy Birds to Identify for $800. This Brown-Headed was found at William Goodrich Jones State Forest in Conroe, Texas back in December 2016. If you recall, this is where the Black-Bellied Whistling-Ducks were found (link here). Unlike the ducks, this Nuthatch was hanging out at the far end of the pond at the extent of my glass – thus the reduced quality of the shots – it also didn’t hang around very long – I spotted it running down the trunk of the tree immediately putting it in the Nuthatch family (dismissed the Creeper family due to the coloring and the fact I could discern it from the tree bark – them Creepers be well camouflaged – link here). I am very familiar with the White-Breasted variety (link here) and previously posted on the Red-Breasted (link here). This post completes the 3rd of the 4 seed stashers in North America. The remaining one for me is the Pygmy but I need to head west for that one. Only have two worthwhile pictures of this specimen – that far away, it could fit in my focus area with plenty of room on the sides. Some quick facts. It definitely prefers to hang out in the southeastern region of the US. It is not a migratory species and known for not traveling far from whatever forest they call their home. As mentioned earlier, they are quite agile traversing tree trunks in all directions thanks to their strong claws. They are a very social bird – if they are around you, you will hear them. They often travel together and have strong family bonds with the male and offspring sticking around to help the female raise the latest batch. For you crossword aficionados out there they participate in allopreening where they wrestle in kiddie pools covered with Aloe Vera – sorry, my fact checking department has just informed me that allopreening simply means they will straighten each other’s feathers. I am skeptical about this correction based on the mere fact that there was an intriguing number of kiddie pools strewn about the trees. In a hurry tonight so no time to go back and check the negatives – will have to take their word. Hope you enjoyed this very brief introduction to my new addition on the bird list!